In Florence, Massachusetts, the Turtles are arguing over where to stop for dinner. Michelangelo suggests pizza, but Leonardo vetoes the idea, as pizza makes him gag. Elsewhere, in a different dimension and in the future, a short, grey alien-like guy named Henry is working in his lab. The doorbell rings and he’s greeted by the lovely Betti Clane. She says she’s been assigned by the Random Dating Council to be his blind date for the evening. This is all news to Henry, but he decides to show her around the lab, anyway. He says that he’s training to become a Temporal Dimensional Analyst and is currently working on building his own time travel gauntlet. Curious, Betti presses a button on the gauntlet and both she and Henry vanish. They arrive in Florence, right in the midst of the Ninja Turtles. Thinking the Turtles to be monsters, Betti begs Henry to get them back home. Unsure of how to use the gauntlet precisely, Henry presses some buttons and accidentally unleashes a number of dinosaurs. 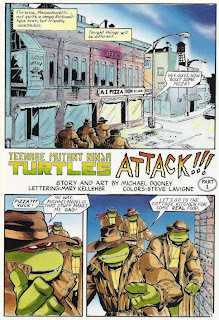 *The story continues in Teenage Mutant Ninja Turtles Attack!!! Part 2. *The Turtles are all clad in their disguises from TMNT (Vol. 1) #14. I love the anachronistic dinosaurs of my youth. You know, back when they didn’t all have feathers, the velociraptor wasn’t the size of a chicken, the T-rex stood lumbering and erect with its tail dragging on the ground and the brontosaurus… er, existed. Stupid advances in paleontology have ruined all the best dinosaurs. As far as I’m concerned, all study of dinosaurs should have ended with that Fred Savage movie. Anyway, Dooney draws a really lovely story, but that’s come to be expected. One detail I dug was when the dinosaurs are brought through the portal, their skeletons are partially visible as they materialize. Just one of the little extra flourishes that puts Dooney’s work at the top of the heap. In my head, I like to think that Henry comes from the same time and place within Null Space as Renet and that a “Temporal Dimensional Analyst” is just one more field overseen by Lord Simultaneous. But that’s just my own head-canon. Anyway, at 6 pages per chapter, “Turtles Attack!! !” runs really fast. Even when you squish em all together, the (lovely) two-page spreads and serial-required cliffhangers eat up space. 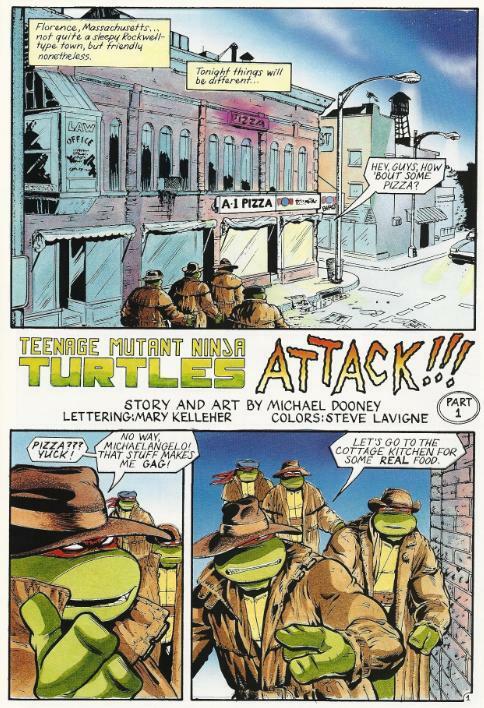 Regardless, it’s a fun multi-parter that serves no other purpose than to show us the Turtles fighting weird enemies as rendered by Michael Dooney. And that’s OK.
"Stupid advances in paleontology have ruined all the best dinosaurs." "Government-mandated blind dating sounds like too bleak and dystopian a future even for George Orwell"
In how many Mirage comics do the TMNT openly disavow pizza? It always comes across to me as a bit of a cheap jab at the cartoon.